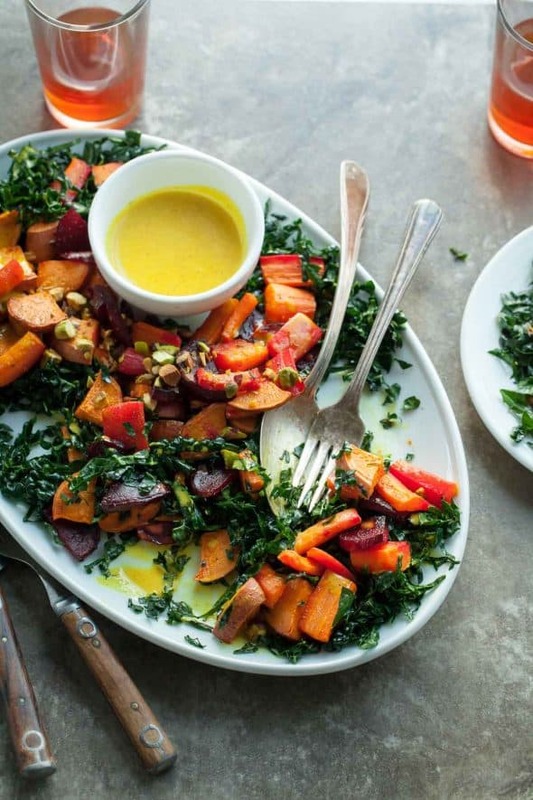 A hearty roasted root vegetable and kale salad with a creamy turmeric dressing. 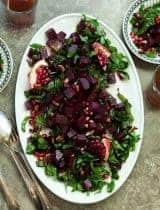 Just because it’s winter doesn’t mean salads need to disappear from the menu altogether, all that’s needed are a few adjustments to make them more suited to the season. 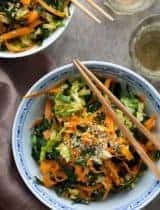 That means swapping out delicate lettuces and raw vegetables and instead turning to hearty greens and winter’s most dependable staple: root vegetables. 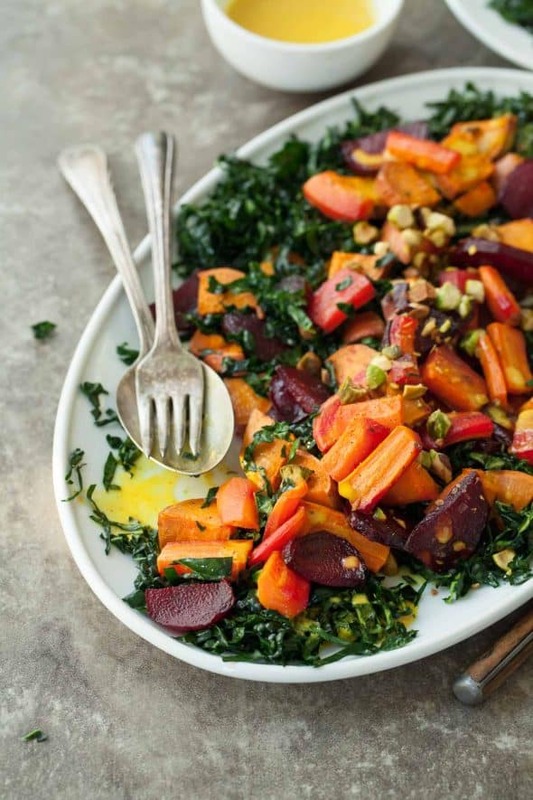 Not only are roots like carrots, beets and sweet potatoes plentiful this time of year, but they roast up beautifully and pair well with cool weather greens like kale. 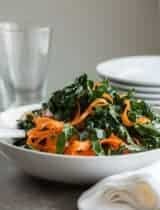 This warm winter salad is built on a base of shredded kale and roasted roots. It’s a substantial salad rich with a variety of flavors and textures. 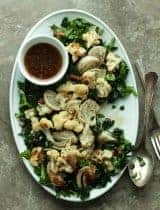 All you need is a sheet pan to roast the roots on while you whisk together a simple dressing and prepare the kale with a quick massage, (long-leafed lacinato (aka Tuscan) kale works best here). 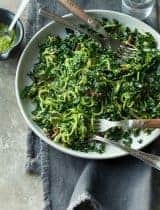 The heat of the oven brings out the inherent sweetness of the roots and gives them a lovely almost caramelized flavor that contrasts nicely with the slight bitterness of the kale leaves and the creaminess of the dressing. Speaking of dressing, this one is spiked with turmeric and black pepper, there’s cashew butter for richness and apple cider vinegar for a bit of acidity. Once out of the oven the vegetables are tossed, still warm, with the dressing to soak up all the goodness then piled on top the bed of kale. A handful of toasted and chopped pistachios bring a little toasty nutty finish to the dish and a bit of crunch. If you’re looking for a warm, hearty and healthy salad this winter, this is one you’ll want to add to the rotation. 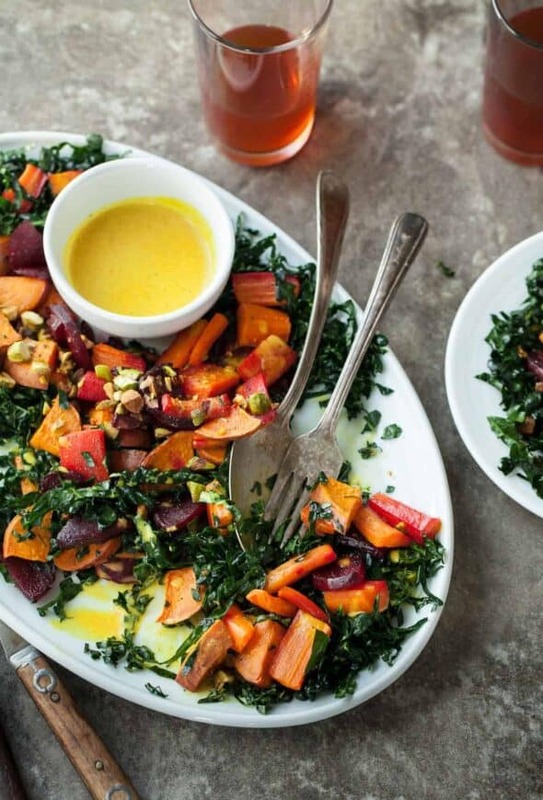 A hearty roasted root vegetable and kale salad with creamy turmeric dressing. On a parchment lined sheet pan toss the sweet potato, carrots, and beets with the coconut oil, maple syrup, salt and pepper. Toss genetly with hands until evenly coated and roast for about 20 minutes, stirring once or twice, until tender and lightly browned in spots. Meanwhile, whisk together all the ingredients for the turmeric dressing together and set aside. 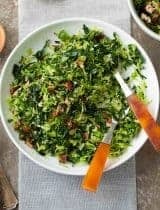 Finely chiffonade the kale into ribbons with a sharp knife then toss with the olive oil and salt in a large bowl, massaging firmly until the leaves soften. 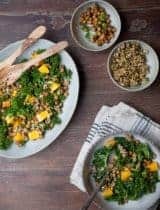 Add the warm vegetables to the kale and drizzle with turmeric dressing. Top the salad with chopped pistachios and serve warm or at room temperature. Roasted veggies in a salad is one of my favourite meals! Have not made with kale -- great idea. Love the addition of the cashew butter in the dressing! Thanks! I could eat root vegetables ALL day! 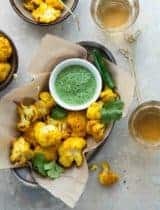 And turmeric is a staple to me so.... YUM This looks amazing. Can peanut butter be used instead of cashew? Peanut butter has a very strong and distinct flavor so it would change the taste of the dressing, what you want is something mild and creamy. You could try almond butter or macadamia butter. You can but it will have a much different flavor since cashew is milder in flavor. I love how humble root vegetables make such a gorgeous salad. Beautiful photos and recipe, as always. suggestions for some other root veggies-dislike beets............ and to swap cashew for almond butter, same ratio?? thanks! Try parsnips instead of beets or just do carrots and sweet potatoes and yes an equal amount of almond butter would work as well.